In the lower part of today's image, a number of circular features are visible, many of which appear to be stacked on top of one another. These roundish features can also be seen, under a different perspective, in an OSIRIS narrow-angle camera image from 16 July 2016. A view of the Imhotep region in the overall context of Comet 67P/C-G is provided in a recent OSIRIS wide-angle camera image, taken on 10 August 2016, and you can find more details about the various geological aspects of this region in the blog post 'Inside Imhotep'. Meanwhile, the OSIRIS team have published a number of striking new views of the comet via their image of the day website. An OSIRIS wide-angle camera image captured less than 7 km from the comet centre on 15 August depicts portions of both lobes of 67P/C-G. The steep cliffs of the small lobe Hathor region are visible on the right, declining towards the neck, which is hidden from sight in this view by the dust-covered terrains of Ash, visible on the right. 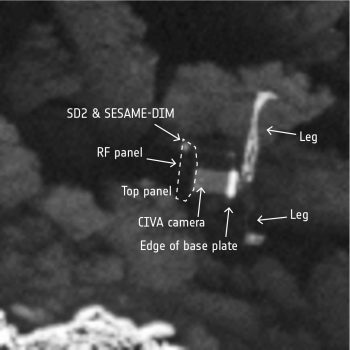 The small, roundish feature visible in the lower part of this image was described the only unambiguously identified impact crater on the comet surface in a paper by N. Thomas et al. 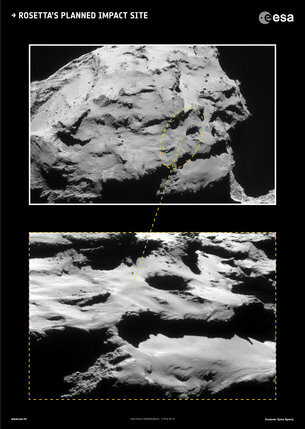 (part of the Science special issue: Catching a Comet, 2015). About 35 m in diameter, the crater appears to have been partially buried by the smooth material that covers the Ash region. Another image, taken with the OSIRIS narrow-angle camera about 6 km from the comet centre on 18 August, depicts in extraordinary detail some of the boulders on a different portion of the Ash region. You can try and find these boulders in another recent OSIRIS image (second from top in this post), which portrays Ash in a broader context – including the above mentioned crater. Another stunningly detailed OSIRIS narrow-angle camera image, taken only a couple of days ago, on 24 August, reveals the rough texture of the Khonsu region (left and lower part of the image) next to the slopes that separate it from Atum, a portion of which is visible in the top right corner. A recent NAVCAM image taken on 8 August 2016 presents a broader view on this region. This week's original NAVCAM image is provided below. Rosetta has imaged the smallest grains of Comet 67P/Churyumov-Gerasimenko’s dust yet, with its Micro-Imaging Dust Analysis System, MIDAS. 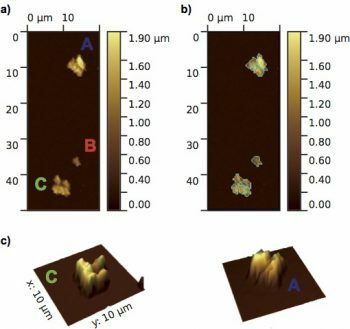 Atomic force microscope topographic images of MIDAS particles A, B, and C. (a) Overview image with a pixel resolution of 312 nm and a colour scale representing height. (b) Sub-units (grains) of the individual particles detected at the resolution of the instrument are outlined. (c) 3D images of particles A and C with two times height exaggeration to aid visualisation. Particles A and C comprise tightly packed ‘compact’ grains, while B appears to be a single grain. The new results, published in the journal Nature, provide evidence that dust particles continue to be aggregates below the size range already reported by the COSIMA instrument. That is, even at the very small scales of a few tens of micrometres down to a few hundred nanometres, the dust grains analysed by MIDAS appear to be made up of numerous smaller grains. Atomic force microscope topographic images of MIDAS compact particle D. (a) Overview image with a pixel resolution of 80 nm and a colour scale representing height. (b) Sub-units (grains) of the particle detected at the resolution of the instrument are outlined. (c) 3D image of the particle with two times height exaggeration to aid visualisation. MIDAS detected both small, tightly packed ‘compact’ grains and larger more porous, loosely arranged ‘fluffy’ grains. The comet grains also appear to be elongated, several times longer in one direction than the others, in agreement with observations of dust in the interstellar medium. Examples of the different types, which were collected by MIDAS from mid-November 2014 to February 2015, are shown in the figures accompanying this post. One particularly large, porous grain captured from Comet 67P/C-G has similar properties to a type of so-called ‘interplanetary dust grain’ (IDP) thought to have grown into porous aggregates of smaller spheroidal particles during the early phases of Solar System formation. These new results from MIDAS further strengthen the link between IDPs and cometary dust. The observed “aggregate of aggregates” structure of the particles gives hints to their formation mechanism, and how such particles could form a weakly bound layer at the surface of the comet nucleus. “Aggregate dust particles at comet 67P/Churyumov-Gerasimenko” by M.S. Bentley et al is published in Nature. See our 2014 blog post "Introducing MIDAS" for background on the instrument. 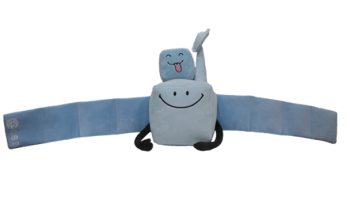 Maybe you've been stimulated to create art, music, or a theatrical production, or perhaps you brought Rosetta and Philae into your every day life at home through creative activities or games with your children. Or did you learn about the mission at school? Maybe you based a project on Rosetta and Philae’s adventures, or even made a further education or career choice inspired by the mission. We will accept submissions until 7 October 2016, but those received before 21 September will also be in with a chance to be showcased during the live programme of Rosetta’s end-of mission-event that will be streamed from ESA's European Space Operations Centre (ESOC) in Darmstadt, Germany, on 30 September. In addition, out of all the submitted contributions, ESA will select one top prize winner who will be invited for a special visit to the European Space Research and Technology Centre (ESTEC), ESA's technical ‘heart’ located in Noordwijk, The Netherlands. 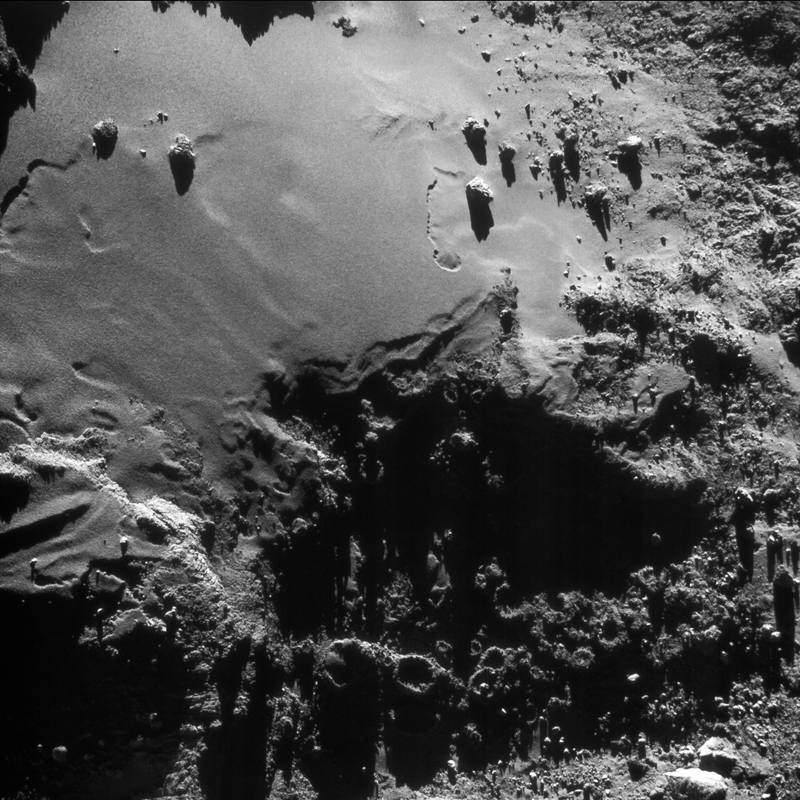 While organics had already been detected in situ on the comet’s surface by instruments on-board Philae and from orbit by Rosetta’s ROSINA , those were both in the form of gases resulting from the sublimation of ices. By contrast, COSIMA has made its detections in solid dust. Their presence was only ever hinted at in previous comet missions, which flew by their targets at high speed and, as a result, disrupted the particles, making characterisation challenging. 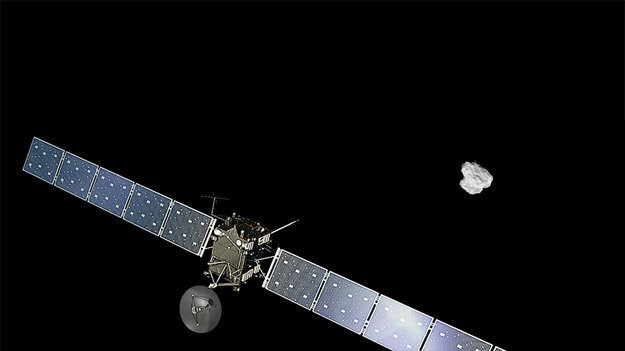 But Rosetta is orbiting Comet 67P/C-G and can catch dust particles moving at low speed. The organic signatures of seven particles are presented in the paper, which the COSIMA team say are representative of the two hundred plus grains analysed so far. 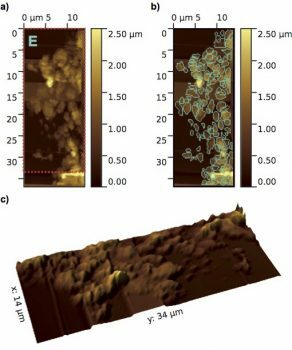 From analyses of meteorites and laboratory simulations, the team was also expecting to identify a wide diversity of organic material in Comet 67P/C-G, ranging from very small molecules to heavy (or ‘high molecular weight’) organics. Although Rosetta’s ROSINA and Philae’s PTOLEMY and COSAC instruments detected numerous low-molecular weight volatile organic molecules, COSIMA only saw very large carbon-bearing macromolecules in the dust particles, with nothing in between. This suggests potentially different sources for the lightweight volatile and heavier refractory carbonaceous material detected in the comet. “Although we cannot know if the organics seen in these dust particles were created in the interstellar medium before the protoplanetary nebula came together, or in the protoplanetary disk during early Solar System formation, COSIMA’s dust grains are certainly witnesses to early formation processes, including that of the comet itself,” says Nicolas Fray, first author of the paper. Die Rosetta-Mission wird am 30. September mit dem kontrollierten Abstieg der Sonde zur Oberfläche ihres Kometen enden. Medienvertreter sind eingeladen, den historischen Abschluss dieser Mission am 29. und 30. September gemeinsam mit den Rosetta-Wissenschafts- und Missionskontrollexperten im Europäischen Raumflugkontrollzentrum (ESOC) der ESA in Darmstadt mitzuverfolgen. Rosetta wurde am 2. 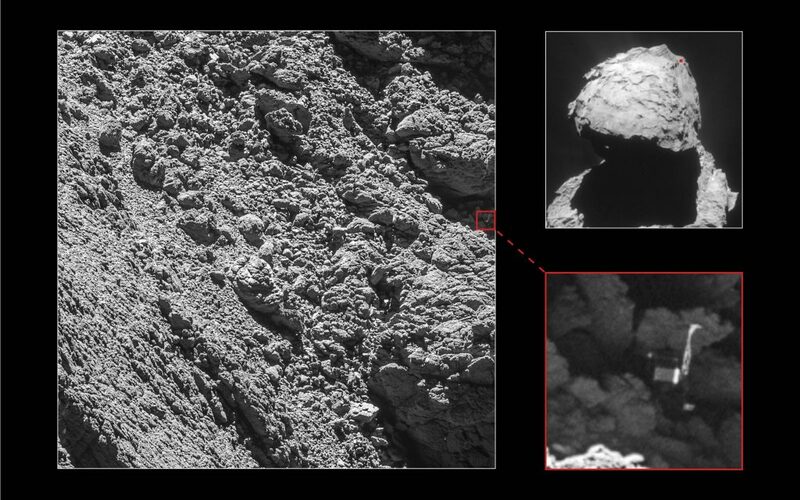 März 2004 gestartet und erreichte den Kometen 67P/Tschurjumow-Gerassimenko nach einer zehnjährigen Reise durch das Sonnensystem am 6. August 2014. Das Landegerät Philae wurde am 12. November 2014 auf der Oberfläche des Kometen abgesetzt. Nachdem die Sonde den Kometen zwei Jahre lang auf Schritt und Tritt begleitet und bei dessen Annäherung an die Sonne eine beispiellose Flut an wissenschaftlichen Daten bereitgestellt hat, entfernen Rosetta und ihr Komet sich nun wieder über die Umlaufbahn des Jupiter hinaus von der Sonne. Da sich Rosetta nun weiter von der Sonne wegbewegt als jemals zuvor und damit erheblich weniger für ihren Betrieb erforderliche Solarenergie zur Verfügung hat, ist das Schicksal der Sonde besiegelt: sie wird Philae auf die Oberfläche des Kometen folgen. Die Bestätigung des Missionsabschlusses wird im Hauptkontrollraum der ESA am 30. September für 13.20 Uhr MESZ +/- 20 Minuten erwartet; die Sonde wird bereits am Vorabend auf Kollisionskurs mit dem Kometen geschickt. In den letzten Stunden ihres Abstiegs wird Rosetta zahlreiche einmalige Messungen durchführen können, darunter die Untersuchung von Gas und Staub in nie dagewesener Nähe zur Oberfläche sowie hochauflösende Aufnahmen des Kometenkerns einschließlich der offenen Gruben in der Ma’at-Region, wo voraussichtlich der kontrollierte Aufprall des Raumfahrzeugs stattfinden wird. Diese Daten dürften bis zum endgültigen Aufprall übertragen werden, danach wird eine Kommunikation mit der Sonde nicht länger möglich sein. Die Medienvertreter sind eingeladen, am 30. September ab 10.00 Uhr MESZ die letzten Betriebsstunden der Mission im ESOC mitzuverfolgen und gemeinsam mit dem Missionsteam den Erfolg dieses sagenhaften Abenteuers zu feiern. Wissenschaftsjournalisten können sich zudem für den 29. September zu einer Nachmittagsveranstaltung mit Rosetta-Wissenschaftsexperten anmelden, bei der die bisherigen wissenschaftlichen Höhepunkte der Mission erläutert werden. Sowohl die Nachmittagsveranstaltung am 29. September als auch der Abschluss der Mission am 30. September können unter www.esa.int über Live-Streaming verfolgt werden. 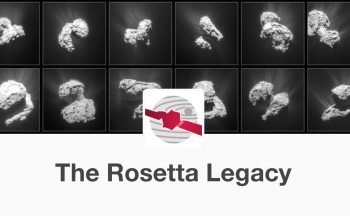 Live-Streaming der Rosetta-Wissenschaftsveranstaltung von 14.30 bis 17.00 Uhr unter www.esa.int. Rosetta hat den Wissenschaftlern zahlreiche Hinweise für die Klärung wichtiger Fragen zu Ursprung und Entwicklung des Kometen, seiner Stellung im frühen Sonnensystem und dem möglichen Beitrag von Kometen zur Entstehung von Leben auf der Erde, darunter Wasser und organisches Material, geliefert. Die Rosetta-Wissenschaftler werden auf einer umfassenden wissenschaftlichen Entdeckungsreise die verschiedenen Puzzleteile zusammensetzen. Zunächst werden die vielseitige Oberfläche des Kometen, sein Innenleben und der von seinem Kern abgegebene Staub erläutert, bevor die Veränderungen in seiner Aktivität im Laufe der Mission und die Interaktion mit seiner Umgebung bei seiner Umrundung der Sonne unter die Lupe genommen werden. Des Weiteren werden die entdeckten organischen Moleküle und die Auswirkungen der gewonnenen Erkenntnisse auf unser Verständnis der Entwicklung unseres Sonnensystems veranschaulicht. Das Medienprogramm umfasst die betrieblichen Höhepunkte des Abstiegs von Rosetta, der per Videostreaming live vom Hauptkontrollraum in das Medienzentrum übertragen wird. Missionsexperten werden die bisherigen wissenschaftlichen Höhepunkte der Mission erläutern und während der Annäherung Rosettas an die Kometenoberfläche die letzten Aufnahmen der Sonde präsentieren. Die Mitglieder des umfangreichen internationalen Rosetta-Teams, darunter Wissenschaftler, Satellitenbetriebspersonal, Ingenieure, Vertreter der ESA, ihrer Partneragenturen und der Industrie sowie einige Ehrengäste, werden die letzten Stunden dieser Kultmission gemeinsam erleben und feiern. Alle Anwesenden stehen für Interviews zur Verfügung. Medienvertreter mit gültigem Presseausweis und/oder einer Akkreditierung für soziale Medien werden gebeten, sich für die Veranstaltung am 30. September unter https://myconvento.com/public/event_register/index/1438240 anzumelden. Journalisten mit besonderem wissenschaftlichem Interesse werden gebeten, sich zudem für die Veranstaltung am 29. September anzumelden, die Plätze hierfür sind jedoch begrenzt. Die Veranstaltungen am 29. und 30. September können unter www.esa.int live im Internet verfolgt werden. Über die betrieblichen Meilensteine der letzten Missionstage wird zudem live über den Rosetta-Blog (blogs.esa.int/rosetta/), über @ESA_Rosetta (twitter.com/ESA_Rosetta ) und auf Twitter über @esaoperations (twitter.com/esaoperations) berichtet (Hashtag #CometLanding). Zur Vorbereitung des Missionsabschlusses wird am 19. September um 14.00 Uhr MESZ ein Hangout on Air veranstaltet, um die letzten Tage und Stunden der Rosetta-Mission vorzustellen und zu erörtern. 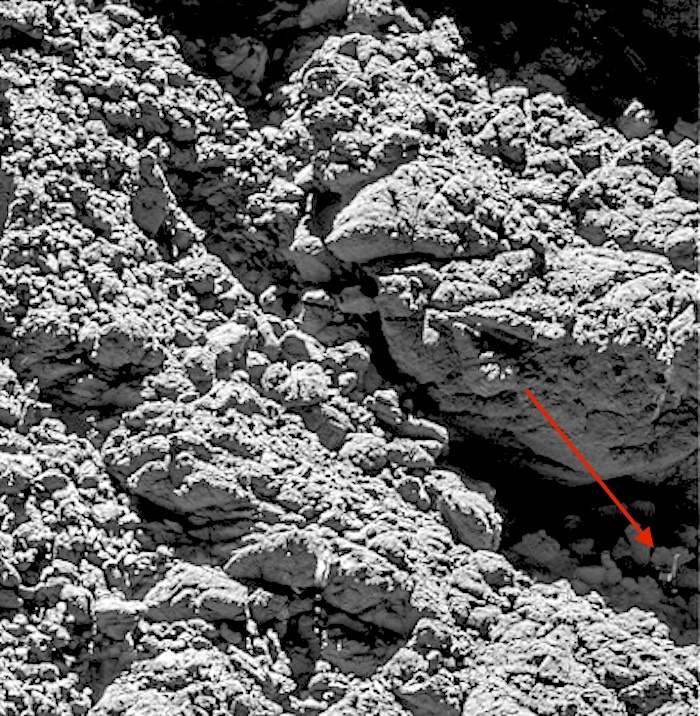 Präsentiert werden der Abstiegsverlauf, die zu empfangenden Aufnahmen und wissenschaftlichen Daten sowie eine Zusammenfassung der Suche nach Philae, die am 5. September zur Entdeckung des Landegeräts auf dem Kometen 67P/Tschurjumow-Gerassimenko führte. Squeezing out unique scientific observations until the very end, Rosetta’s thrilling mission will culminate with a descent on 30 September towards a region of active pits on the comet’s ‘head’. The region, known as Ma’at, lies on the smaller of the two lobes of Comet 67P/Churyumov–Gerasimenko. It is home to several active pits more than 100 m in diameter and 50–60 m in depth – where a number of the comet’s dust jets originate. The walls of the pits also exhibit intriguing metre-sized lumpy structures called ‘goosebumps’, which scientists believe could be the signatures of early ‘cometesimals’ that assembled to create the comet in the early phases of Solar System formation. Like the archaeological artefacts found inside the Egyptian pit that tell historians about life in that town, the comet’s pit contains clues to the geological history of the region. Rosetta will target a point very close to Deir el-Medina, within an ellipse about 700 x 500 m.
“Although we’ve been flying Rosetta around the comet for two years now, keeping it operating safely for the final weeks of the mission in the unpredictable environment of this comet and so far from the Sun and Earth, will be our biggest challenge yet,” says Sylvain Lodiot, ESA’s spacecraft operations manager. The final flyover will be complete on 24 September. 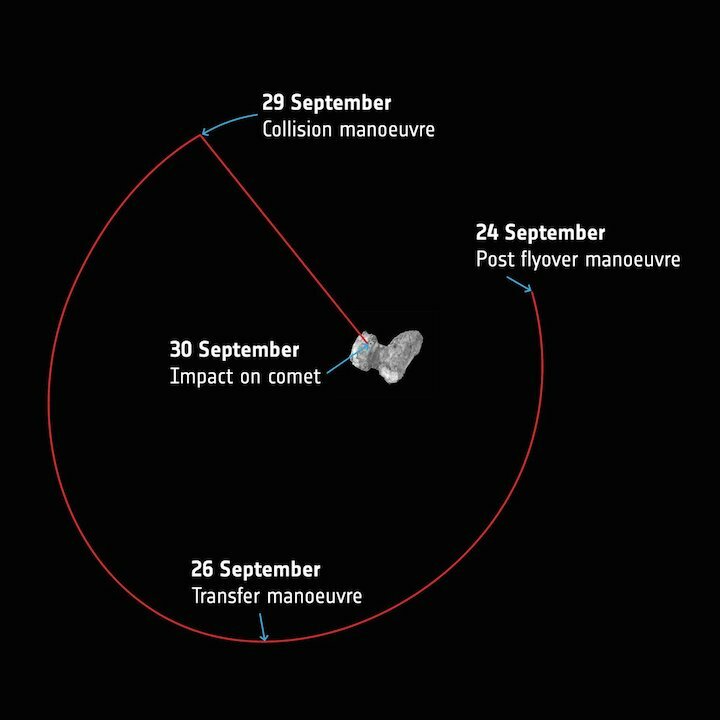 Then a short series of manoeuvres needed to line Rosetta up with the target impact site will be executed over the following days as it transfers from flying elliptical orbits around the comet onto a trajectory that will eventually take it to the comet’s surface on 30 September.